After reading Crash's blog with all his Garden Guests I wondered why we hadn't seen any snakes for a while. Then two appeared within a week or so. This is a Slaty-grey Snake, Stegonotus cucullatus. This one was a little over three quarters of a metre in length. 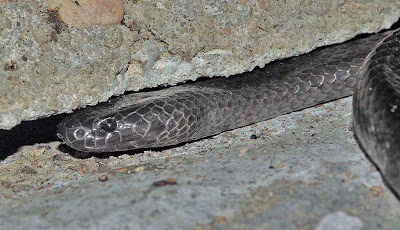 Slaty-greys are members of the family Colubridae, the same family to which many harmless North American snakes belong like the Gopher Snake, Racers and the like. This snake is harmless and a bite is not dangerous. This snake was abroad at night during a heavy rainstorm. It was probably searching for reptiles like House Geckos that run along the sidings. The Slaty-grey did not react to my presence and I left it to go about its business. Then came this little fellow. This one measured less than a foot in length and was very thin. It is apparently a Small-eyed Snake, Rhinoplocephalus nigrescens. It had taken up residence under a rubber matt that had an escape crack to a rock garden. This snake is a different matter when it comes to danger. It is a member of the Elapidae, the family to which the Brown Snake, Tiger Snake and many many other Australian snakes belong. This little snake is dangerous and can deliver a potentially fatal bite. It seemed to like its position under the matt where it could also feed on small lizards. I waited until it was cool and then swept it into a bug net and relocated it alongside a log a considerable distance from the house. The take-home message in all of this is that with Australian snakes it is often difficult to tell whether you have a harmless creature or one that could send you to the hospital. The best solution is just to leave them alone and they will be on their way. If one enters the house, the police department can provide access to local "snake removers" who will come and remove the snake at no cost and relocate it to where it will not cause any harm. Thanks to Michael Cermak and Peter Shanahan for help with the identifications.